Gloucester City Hall is located at 9 Dale Avenue, Gloucester, MA 01930; phone: 978-281-9720. 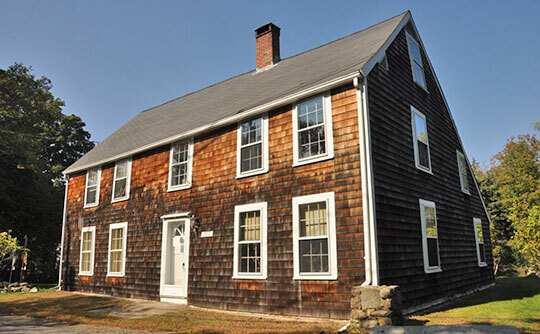 Photo: Ella Proctor House, ca, 1672, 189 Concord Street, Gloucester, MA. Listed on the National Register of Historic Places in 1990. Photographed by User:Magicpiano (own work), 2012, [cc-by-3.0 (creativecommons.org/licenses/by/3.0)], via Wikimedia Commons, accessed September, 2017. It is more than likely that the permanent settlement of Gloucester was effected in the autumn of 1631. Tradition says that Abraham Robinson, a son of the old pastor of the Pilgrims at Leyden, Reverend John Robinson, came with his mother and her family to Plymouth in 1630. The following year Robinson and a few more sailed over from Plymouth, and, landing at Annisquam, were so well satisfied with the country, as it seemed good for the ocean fishing business, that they set up a fishing stage, and made preparation for the accommodation of their families. At the General Court, says one writer in 1641, the deputy governor (Mr. Endicott) and Messrs. Downing and Hathorne, deputies from Salem, were appointed commissioners, to view and settle the boundaries of Ipswich, Cape Ann and Jeffries' Creek (Manchester). The commissioners appointed the following 8 men to manage the affairs of the plantation for 1642: William Stevens, Mr. Sadler, Obediah Bruen, George Norton, William Addes, Thomas Milward, Mr. Fryer and Walter Tybott. About this time a large and influential addition was made to the population with the coming of Reverend Richard Blynman, with several families, from Plymouth. In May, 1642, the settlement was incorporated by the simple form then employed, and called Gloucester, from Gloucester in England, the native place of several of the settlers. Gloucester was incorporated as a city in 1783 with the Honorable Robert R. Fears serving as mayor. Benjamin F. Arrington, editor, Municipal History of Essex County in Massachusetts, Tercentenary Edition, Volume II, Lewis Historical Publishing Company, New York, 1922.